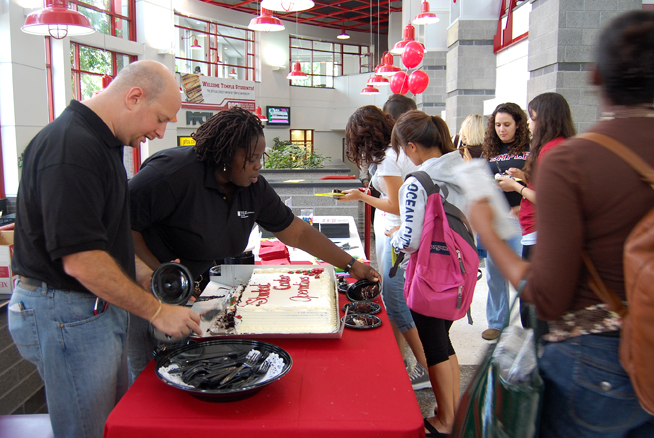 The Student Center Operations Staff organizes a birthday party all over campus to celebrate with faculty, staff and students. The Student Center, Liacouras Walk and the Bell Tower all had one thing in common yesterday. The three Temple hot spots served as venues to commemorate the Student Center Operations staff’s second birthday. At all three locations, operations staff members greeted students and encouraged them to engage in festivities. On Liacouras Walk, Operations Manager Joshua Stern and coworkers promoted the birthday by engaging in conversation with campus members and persuading them to guess the number of gumballs in the jar on the table. The winner received a gift certificate to Jimmy John’s. The Bell Tower and the Student Center had cake, candy and giveaways such as mouse pads, pens and other promotional items. The event was held to promote Student Center Operations to the campus community. Two years ago, the operations department did not exist, and Student Activities managed the entire Student Center building. After the Student Activities director left two and a half years ago, Jason Levy’s position as Student Operations director was created. As the Student Center expanded, Student Operations became its own department. Levy said his department formed out of the need to have more people managing the building. “The building has grown in size and complexity over the last few years, and [Student Activities] wanted someone to come in and really focus on the facility and all of the pieces of the building, managing all of the game rooms, cinema and all of the operational areas,” Levy said. Student Operations offers many other services in addition to building and operational management. Sharon Torres, assistant director of the operations department, mentioned that the department offers an array of services to the Temple community. Aside from the game rooms and cinema, the department also offers a graphics media center and spaces for conferences and receptions. The department is also in charge of The Village. Students and faculty cut the cake on the floor of the Student Center celebrating two years of service for Student Center Operations (Kim Burnick/TTN). Besides promoting and marketing the department, the Student Center Operations team really wanted to use the birthday to let students know that the building is not called “the SAC.” This was a unanimous goal among the staff. Stern would not even utter “SAC,” proving that Student Operations is dedicated to avoiding its usage, as suggested by Campbell. The event also provided students with much more needed information. Rosina Licciardello was one of many students who did not know Student Operations and Student Activities were two separate departments. Licciardello picked up one of the colorful brochures provided by Stern’s team at Liacouras Walk. Meagan Prescott, a new Temple student, said she received an e-mail about yesterday’s event, but other than that she did not know much about Student Operations. She said the department was doing a good job promoting itself, especially in the Student Center. “I’ve seen people go to several booths across campus, and the Student Center is the best place to advertise because more people go through there than anywhere else on campus,” Prescott said. Aaron Wyche was one of the only students who knew that Student Activities and Student Operations were different departments. “I knew that because I’ve had to plan for events for my organizations. I wasn’t too sure what the difference was, but I knew there was a difference between the two departments,” Wyche said. Levy is confident that his department will gain further recognition. Joshua Fernandez can be reached at josh.fernandez@temple.edu. Every Friday, two men preach impromptu sermons to passers-by at the Bell Tower, receiving mixed reactions from students and faculty.